The weather is fabulous and here we are again in our village of Assos! 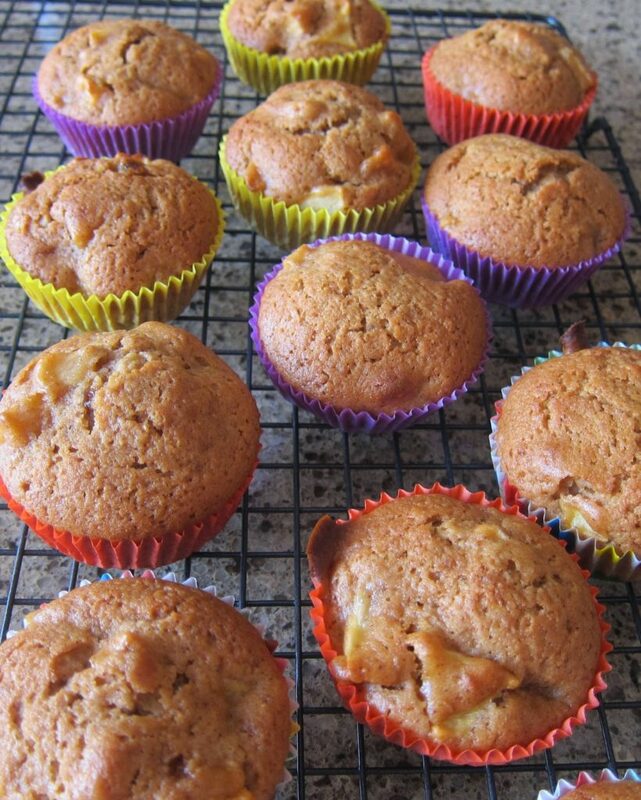 Before I get into proper summery-type dishes (dependent on a visit to the market), I do want to post this oh-so-English teatime Apple Cinnamon Muffins treat of a recipe! Preheat oven to 200C/gas mark 6 and line your muffin tin with papers. Peel and core the apples, then chop into small dice. Put to one side. Measure the flour, baking powder and 1 tsp of the ground cinnamon into a bowl. Whisk together the 125g brown sugar, the honey, yogurt, vegetable oil and eggs in another bowl or jug. Chop the almonds roughly (if using) and add half of them to the flour mixture, and put the other half into a small bowl with the second tsp of ground cinnamon and the 4 extra tsp brown sugar. This will make the topping for the muffins. Now fold the wet ingredients into the dry. Add the chopped apple, and stir to combine but don’t over mix. Nigella’s Tip: a lumpy batter makes for a lighter muffin. Spoon this batter into the muffin papers, then sprinkle the rubbly topping over them. Pop the tin into the preheated oven, and bake for about 20 minutes by which time they will have risen and become golden. Take the tin out of the oven and let it stand for about 5 minutes before taking out the muffins and placing them on a wire cooling rack. Last week was a VERY hectic week for all manner of reasons, all of them pleasurable I hasten to say. Mid-week was Eva’s third birthday so on my side, that involved some cookie, cake and muffin baking! It really took me back, I can tell you! As always in these situations, I, probably like most of us, tend to fall back on the old favourites so it was Joan’s Chocolate Chip Cookies and then the Chocolate Fudge Cake decorated with slivers of walnut and glacé cherries as well as with new Migros find: little white chocolate hearts! Butttt the muffins were new. which is full of family-type recipes and there indeed, I fell upon the perfect recipe: Apple & Cinnamon Muffins! Eureka! The measurements are metric which is fine but I do find the liquid ones a bit of a pain so have translated them into tablespoons. I also added some ounce equivalents. This is one of those recipes that uses oil instead of butter. 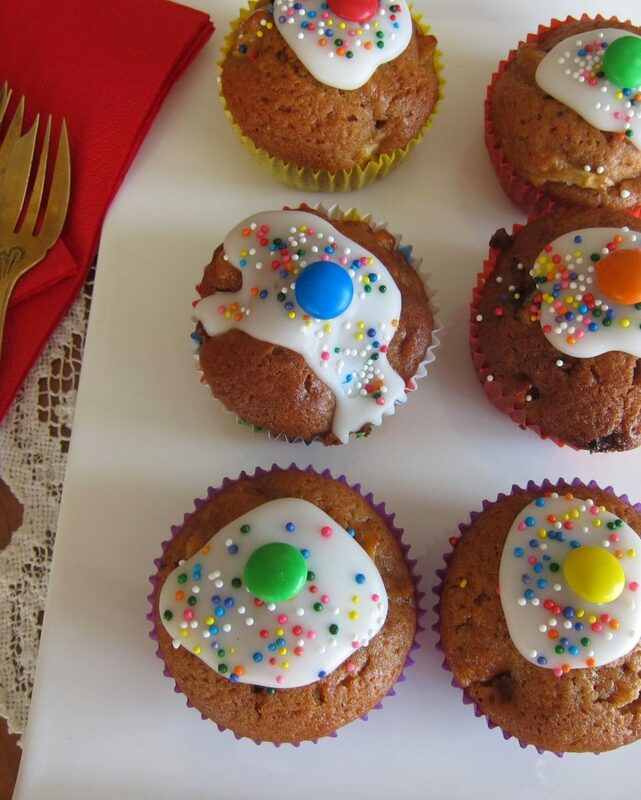 To make the muffins more colourful and birthday party-ish, I topped each with a dab of glacé icing ( simply sieve some icing sugar into a small bowl and add some cold water. Be careful not to overdo the water as you don’t it too runny) and then a smartie with a few sprinkles – sure enough, what did Eva love: the smartie! If you used the topping suggested in the actual recipe, the muffins would immediately assume a more sedate appearance and could grace the best tea table! These muffins are best eaten on the day of making but can be baked up to 1 day ahead and stored in an airtight container, layered with baking parchment. Will keep for 2-3 days. I made them the day before and they were fine although the colour from the smarties did run a little overnight! The muffins can be frozen too, ditto in an airtight container layered with baking parchment, for up to 2 months. Defrost for 3-4 hours on a wire rack at room temperature. 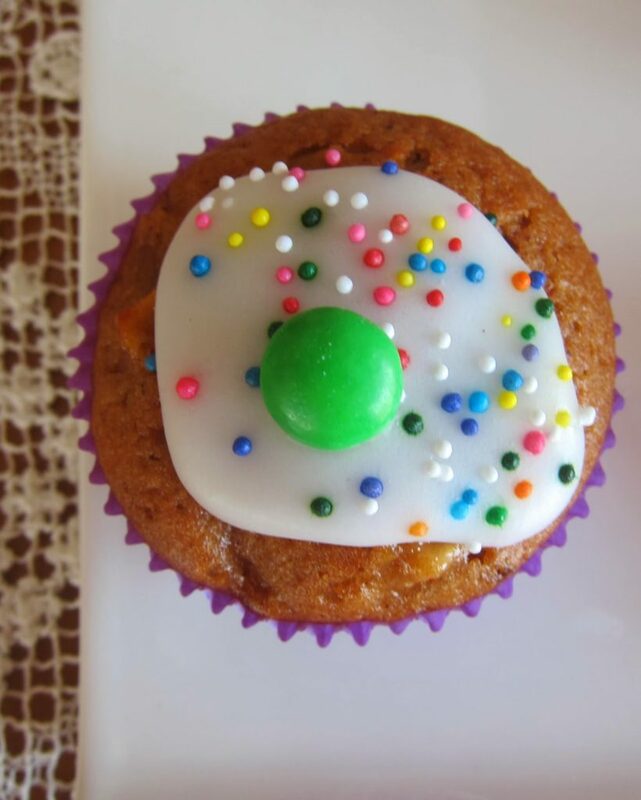 You don’t have to wait for a birthday to make these little muffins! Go on, make them today! Previous Post: « Stuffed Artichokes with Peas & Dill: another Ottolenghi!